Sgt. Don Collier's (Brad Pitt) war is a harsh one. It's kill or be killed, and Collier would rather be on one side of that equation than the other. His team of tank operators is comprised of the rag tag group that typically comes standard in this type of film. There is the hillbilly (Jon Bernthal), the religious one (Shia LaBeouf) and the "not white" one (Michael Peña). Names aren't important. Of course there will also also the new guy. The new guy's role is to serve as an audience surrogate. He experiences the horror of war for the first time, along with audience members. In Fury, is also charts his growth, in the film's estimate, from a boy to a man. He's gotta toughen up, and learn to drink, kill and screw. They will make a man out of him yet. Masculinity is depicted in a curious way in Fury. The film calls back to a previous era, when tough guys handled their business (i.e. killed) without complaint or emotion. Here, tough guys handle their business, but they are allowed to cry - though preferable when drunk or when no one is looking. Fury rides the line between several different tones. The buddy picture, the war epic and the action film all get borrowed from. The tank crew gets to do heroic things, but no one would call them traditional white hat "good guys." Old school ideals of "the good war" led by patriotic soldiers butts up against contemporary war weariness. 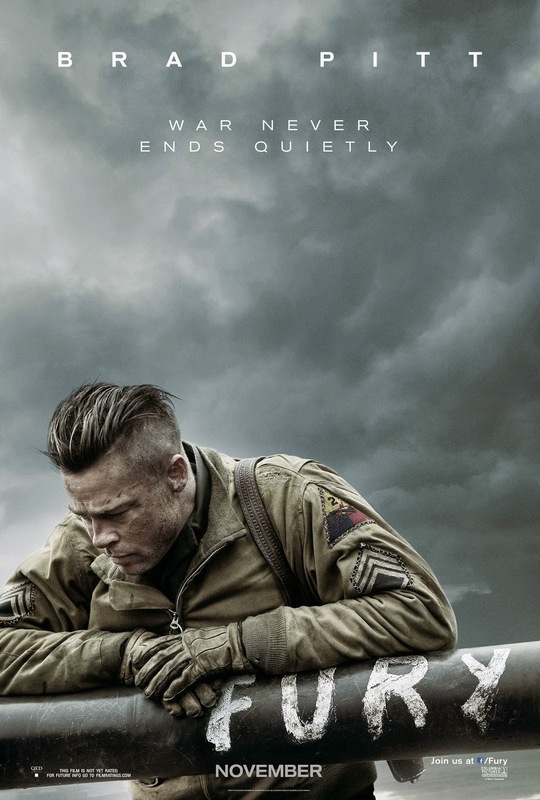 No one really questions if the war is worth fighting (and one is really arguing that about WWII), but war is is shown to take a toll on even Brad Pitt's tough guy leader. Released far outside of the World War II picture cycle started by Saving Private Ryan, there really is nothing to strongly recommend or dissuade audiences from seeing Fury. The tank battles are thrilling in traditional action picture ways. The lead cast all does well, and there's plenty of room for rivalries, revelations and revelry. Really the most interesting thing of the picture is the way old school and modern ideals converge in occasionally conflicting ways. David Ayer writes and directs Fury. Ayer came to prominence as the screenwriter of Training Day, and has recently increased his profile with recent films End of Watch and Sabotage.